Self portrait, love me some Ramune. background is by joannastar-stock, go check her out. ..why do i feel like the person who made this is a weeaboo..? 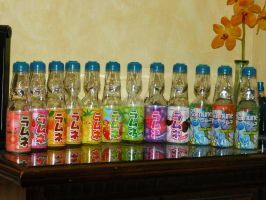 I love Ramune! green apple is my favorite! LYCHEE RAMUNE BEST FLAVOR EVAR! Where did you get the camera from? I keep searching nikon d80 but i can only find it's accessories? What kind of hair dye did you use? My hair is platinum blonde and I'd DIE if I had blue hair like yours!!! <333 In a good way lol, what dye is it?? and whats the name of the color, please? Am I the only one here who thinks that bottle looks... Disturbing? ...I sadly agree with you. Love the colors, that is my fave shade of blue forever. oo!! it's lychee, thats my favorite flavor!! nice!! birght colours, very stylish!! I love the lychee flavor. Awesome! Pretty colors! Great drink. This is cute! It's so bright and Ramune is the best drink ever. Everytime I see this pic in my faves I love it. :3 thanks for posting haha. I Love The Hair!! Mine Used To Be Like That, A Bit Lighter Though.. I like how the colors clash so nicely. i have some of this at home! It has a bubble pop electric feel.